For a list of other proposed and partially developed systems, including Russia's RONASS and Europe's Galileo, see satellite navigation system. Satellite Navigation Systems can be used for determining one's precise location and providing a highly accurate time reference almost anywhere on Earth or in Earth orbit. The accuracy of the GPS signal itself is about 5 meters (16 ft) as of 2005 and has steadily improved over the last 15 years. Using differential GPS and other error-correcting techniques, the accuracy can be improved to about 1 cm (.4 in) over short distances. The GPS system was designed by and is controlled by the United States Department of Defense and can be used by anyone, free of charge. The GPS system is divided into three segments: space, control and user. The space segment comprises the GPS satellite constellation of at least 24 satellites in an intermediate circular orbit (ICO) . The control segment comprises ground stations around the world that are responsible for monitoring the flight paths of the GPS satellites, synchronizing the satellites' onboard atomic clocks, and uploading data for transmission by the satellites. The user segment consists of GPS receivers used for both military and civilian applications. A GPS receiver decodes time signal transmissions from multiple satellites and calculates its position by trilateration. Daily management of the GPS satellite constellation is conducted by the 2d Space Operations Squadron at Schriever Air Force Base. The cost of maintaining the system is approximately US$400 million per year, including the replacement of aging satellites. The first GPS satellite was launched in February 1978, and the most recent launch was in September 2005. The oldest GPS satellite still in operation was launched in February 1989. The system consists of a constellation of at least 24 satellites in 6 orbital planes. The GPS satellites were initially manufactured by Rockwell and now manufactured by Lockheed Martin. The first was launched in February 1978, and the most recent was launched September 25, 2005. Each satellite circles the Earth twice every day at an altitude of 20,200 kilometres (12,600 miles). 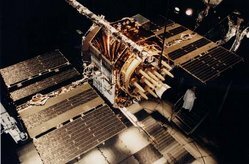 The satellites carry atomic clocks and constantly broadcast the precise time according to their own clock, along with administrative information including the orbital elements of their own motion, as determined by a set of ground-based observatories. The receiver does not need a precise clock, but does need a clock with good short-term stability and the ability to receive signals from four satellites in order to determine its own latitude, longitude, elevation, and the precise time. The receiver computes the distance to each of the four satellites from the difference between local time and the time the satellite signals were sent (this distance is called a pseudorange). It then decodes the satellitesâ€™ locations from their radio signals and an internal database. The receiver should now be located at the intersection of four spheres, one around each satellite, with a radius equal to the time delay between the satellite and the receiver multiplied by the speed of the radio signals. Because the receiver does not have a very precise clock it cannot compute the time delays. However, it can measure with high precision the differences between the times when the various messages were received and hence use multilateration to accurately locate itself. This yields 3 hyperboloids of revolution of two sheets, whose intersection point gives the precise location of the receiver. This is why at least four satellites are needed: fewer than 4 satellites yield 2 hyperboloids, whose intersection is a curve; it is impossible to know where the receiver is located along the curve without supplemental information, such as elevation. If elevation information is already known, only signals from three satellites are needed (the point is then defined as the intersection of two hyperboloids and an ellipsoid representing the Earth at this altitude).